Many older horses suffer from dental problems. An old horse with good teeth gets enough energy from roughage alone. An old horse may eat as much roughage as it can. Experience has shown that a horse stops eating when it has roughage all day long. If the hay or the pre-dried silage that is fed is not rich enough, it can be decided to replace it (or to replace part of it) with Compact Grass or Grass Mix. Every horse has a daily need for vitamins, minerals, trace elements and amino acids. These building materials are found in chunks and muesli. Feeding chunks and muesli has the disadvantage that less saliva is produced because less chewing is done on the chunk. There are no fibers in concentrate and it does not contribute to healthy intestinal flora. In the stomach there are bacteria that produce volatile fatty acids. The composition of the volatile fatty acids is different in the breakdown of starch and sugars than in fibers. Too many grains, starch and sugar-rich concentrates provide a very acidic stomach content. An old horse with little labor does not burn the sugars that are released during the digestion of concentrate. This can cause acidification. Just like too high a protein content in the concentrate that can cause problems such as stable legs. An old (er) horse functions well on a lot of roughage and little or no concentrate. The Hartog assortment also includes the Lucerne mix, which is very suitable for old (honorary) horses. Lucerne mix consists of freshly chopped lucerne mixed with green harvested oat plants and clover ingredients. This combination guarantees an increased energy content with a reduced content of digestible proteins. Furthermore, molasses and vegetable oil have been added to this roughage mix. This product contains all daily building materials such as vitamins, minerals, trace elements and amino acids. The lucerne is full of fiber for a good stomach and intestinal flora. The horse or pony eats the Lucerne mix slowly, so the horse or pony can eat naturally and the development of saliva will be promoted. The Lucerne mix can be fed 2 to 3 times daily next to the hay or pre-dried silage. It can be fed in the feeding box XL or, for example, in a 10-liter bucket. When the bucket is well pressed, 2 kg in the bucket. It is possible that the horse also gets a lot of exercise on his or her old age. This makes it possible for the horse or pony to get too little energy from the roughage. If you notice that the horse or the pony falls off because the flanks, neck and back are incident, a lightly digestible cereal mix can be added for some extra energy. The Balance horse muesli is perfectly suited for this. Many older horses suffer from dental problems. Because of this, the horse can no longer eat hay or pre-dry pit and will turn balls of it instead of chewing. Forage is very important for an old horse. In the Hartog range you will find the Grass mix and Compact Grass. These are excellent hay and pre-dried pit replacements. Hartog is familiar with this problem and has a lot of experience from the clientele with horses and ponies with dental problems that the Grass mix and the Compact grass can eat well. Horses with dental problems also need building materials every day. The Hartog Lucerne mix gives the horse that daily need. Feed the Hartog Lucerne mix twice a day in a 10 liter bucket. The Hartog Feeding Box XL is also very well used for feeding Hartog Lucerne mix and for other Hartog feeders. A mineral lick can always be hung in the box or whey of the horse. The horse or pony will use this when there is a shortage of minerals. 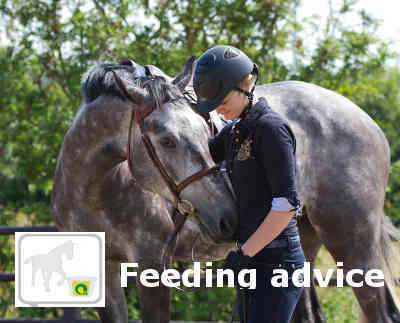 In addition to the Hartog Lucerne mix, it is not necessary to feed other food supplements. All horses and ponies are different. If you need tailor-made advice about feeding Hartog horse feed, please contact us. It is also possible to calculate the feed ration for your horse or pony with Hartog Feeding advice. For more information, check out our different types of horse feed or find the nearest Hartog horse feed sales point.